The Assault exercise bike AirBike – THE air resistance bike for workouts without limits! Being developed by sports and fitness engineers and under permanent improvement by athletes, gym owners, coaches, and therapists, you will enjoy the Assault AirBike a lot. This exclusive power machine is bursting with strength. Are you looking for a whole body training machine, which makes your muscles burn? Then you are ideally advised with the Assault exercise bike AirBike. Get convinced by this power pack and benefit from workouts without limits! No matter whether you are a beginner or a competition oriented sportsman - the innovative AirBike exercise bike of the company Assault Fitness is perfect for cardio and cross training sessions. The AirBike is equipped with two sturdy handles, which ensure that the movement of the arms reminds of the arm movement with an elliptical cross trainer. This innovative AirBike allows hence a whole body training of highest level. Pushing, Pedalling, pulling - experience a challenging whole body traiing, which does not only train the aerobic and anaerobic cardio, but strengthens additionally the muscles. Intensive training sessions with the Assault AirBike make a lot of fun and stimulate your fat metabolism extremely. This results in an increased calory consumption. For those among you, who always look for innovative and effective training machines, the Assault exercise bike AirBike is the perfect training equipment. It allows highly intensive whole body workouts with very joint-gentle, smooth courses of motion. How is the resistance controlled while exercising with the Assault AirBike? The setting of the resistance is not required, because it is infinitely variable thanks to the air resistance sysetm and controllable thanks to the number of rotations. The wattage is not entered as default, but is the result of your training performance. You can decide individually how actively you use your body and whether you want to challenge more either your upper or lower body. The quicker you pedal, the bigger gets the resistance. The wattage is calibrated for 5 to 150 RPM. 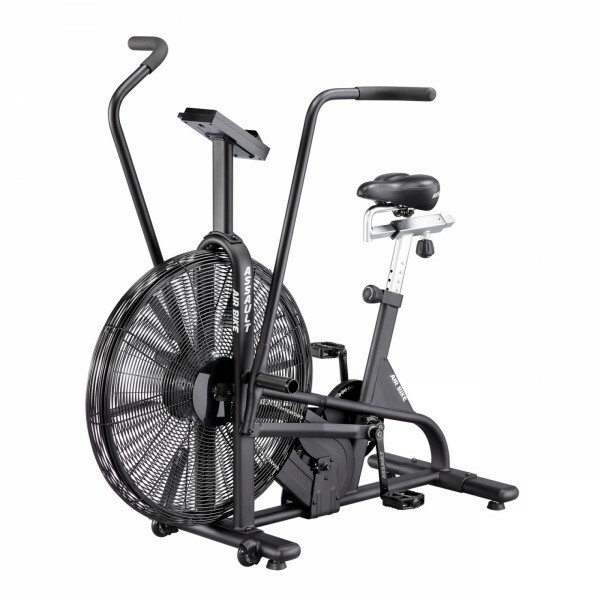 The Assault exercise bike AirBike is equipped with the most modern technologies and is made of first-class materials. Being extremely sturdy, it is made of a stable steel construction and is absolutely oustanding in stability. A lateral wobbling is almost excluded for highly intensive training sessions. The manufacturer also focussed on the training comfort: The hybrid seat is sweat resistant, sporty, ergonomically shaped, and allows versatile adjustments. The seat adjustments are done with a simple pop-pin-handle. The pedals are reinforced. The display is clearly structured, is not overloaded, and shows all important training data optimally (distance, performance, time, calories, heart rate). No matter, whether you do a constant training depending upon your heart rate or a high-intensity interval training (HIIT) - everything is possible. The training computer of the Assault exercise bike AirBike is also equipped with further pre-programmed training versions, so that your workout adapts easily to your requirements. 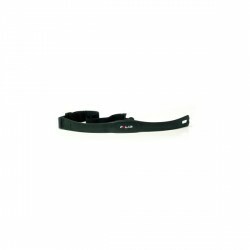 By means of a separately available chest strap, you can check your heart rate wirelessly. The Dual-Action design ensures that the movement of arms and legs is synchronic, so that the course of motion remains natural. The pegs allow an isolated upper body training. Assault Bike wind shield In stock! Assault exercise bike AirBike add to comparison list.